In a director’s note Farrington reveals that, like Hare’s, her play is inspired by the life of a famous writer, Edith Wharton, who had an unrequited love for Morton Fullerton—“an openly bisexual socialite who emotionally tortured her,” Farrington writes. Set in 1907 (electricity has just arrived in the home of its wealthy subjects), Farrington’s drama concerns Harry and Grace Hunter, who have a marriage that doesn’t seem completely to work—at least from what we hear. Grace (Gabriella Rhodeen), a successful novelist, is besotted with a dandy named Delancey Morris, about whom she gossips with her maid, Lucy. Christopher Tocco (left) plays Delancey Morris, and Kyle Stockburger is Harry Hunter in Sara Farrington's Leisure, Labor, Lust. Top: Grace Hunter (Gabriella Rhodeen, left) and her maid Lucy (Stephanie Regina) put on airs to gossip about society people. The author has chosen to direct her own work for The Tank, and that’s almost always a serious mistake—Conor McPherson being a notable exception. It might have helped to have someone tamp down the obstacles Farrington puts in front of the audience. In the first part, Harry, Morris, and Lucy are all played by Stephanie Regina, who clomps around heavily as the male characters in what seems to be a two-actor play; helpfully, she invokes a deep and resonant voice to make one pay attention to her opposite-gender roles. At a party in a flashback, she becomes Morris and dances with Rhodeen’s Grace. As the mistress and servant, Rhodeen and Regina mockingly put on hoity-toity accents for the society swells they gossip about. And both briefly become actors in the play Simone by the obscure French playwright Eugène Brieux, complete with melodramatic scene freezes. Eventually it all leads to an assignation scene between Grace and a concierge at a hotel where she goes to meet Morris—and where Rhodeen conducts a conversation with herself as she plays both Grace and the concierge! If this sounds daringly cutting-edge rather than utterly absurd, hurry yourself to the box office. The gender-blind casting proves less a distraction, though, than the numerous flashbacks used for what is essentially an inquest into the Hunters’ marriage after Harry is dead. No sooner is a dinner party or a birthday party mentioned than there is a scene that flashes back to it. The choppy scenes occasionally turn up something of interest. Descriptions of a waltz playing in the distance or oyster stuffing in a turkey certainly evoke the milieu Farrington is writing about. At one point, Grace explains to Lucy the format of colored papers and inks for social correspondence. Look: an RSVP to dinner: blonde with charcoal black. For a weekend visit: eggshell with indigo. But for an RSVP to the theater, especially in spring, pigeon’s blood stationery and alabaster ink. It’s those little peep holes into people that matter the very most! Regina plays both men and women in the first half. Photographs by Sammy Tunis. Before one can ponder how colors came to be so rigidly prescribed (the details come without explanation), things become stranger still. Halfway through, Kyle Stockburger arrives on stage to replace Regina as Harry Hunter, and Christopher Tocco takes over the role of Delancey Morris from Regina; he also introduces a new character, a second servant in the house, who has below-stairs scenes with Lucy just before the male Harry appears. 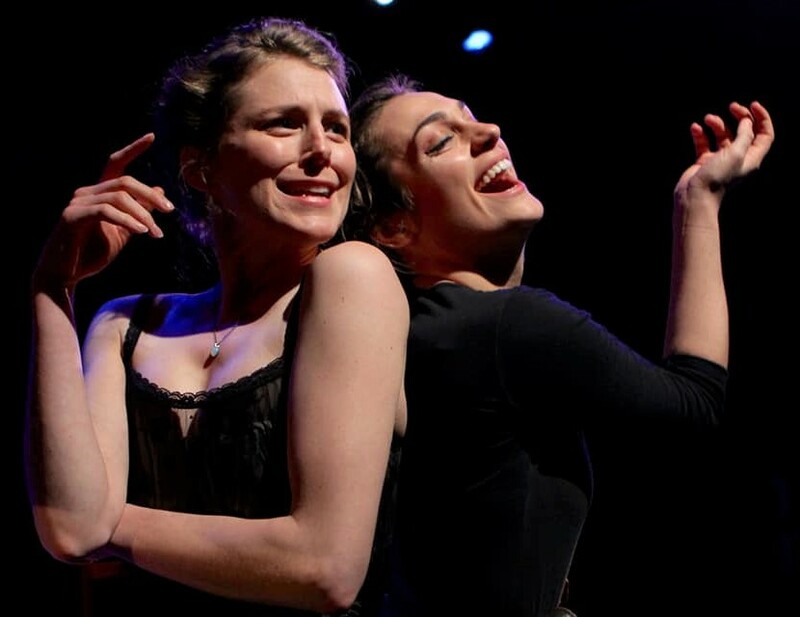 By the time you’ve stopped wondering whether the two actors were delayed by the subway and managed to arrive just in time to take up their parts, the women have essentially exited the piece. The second half turns to Harry’s gay romance with Morris and follows his inability to break from society’s strictures and run off with his lover to an upstate hideaway. The gay episode is full of guilty desire and stiff upper lips, as, in flashbacks again (aided by Brian Aldous’s instantaneous light changes), one sees Morris’s vain attempts to get Harry to leave his wife. They encounter each other at birthday parties given by a friend, Georgie Howard, 10 and 20 years earlier. Both actors are well-spoken, but the flashbacks undercut any momentum to their story. Rather, they become speed bumps, coming so fast and furiously that you may get theatrical whiplash. Farrington’s direction has the women often facing out to the audience to deliver their lines, and it’s boring. With the men, the habit is less obtrusive, but nonetheless distancing. It’s unfortunate she didn’t trust someone else to look at the script and give it a better chance for success. Performances of Sara Farrington’s Leisure, Labor, Lust are at 7:30 p.m. Thursday through Sunday until April 22 at The Tank (312 West 36th St., between Eighth and Ninth avenues). Tickets ($25) are available for advance purchase at thetanknyc.org.